Nothing, but nothing, beats having Outlook open on one screen and your browser on another. Or your browser and Excel. Or Excel and Word. You get the idea. This approach not only saves you the time and hassle of switching back and forth between windows, but also makes multiple windows visible simultaneously -- great for when you need to, say, drag and drop data from one to another. Best of all, monitors are cheap. You can add a 22-inch LCD to your setup for under $150, or a 24-inch display for under $200. 1. A pivoting display. Think about it: documents, Web pages, and even some photos are meant to be viewed in a portrait orientation -- and yet we shoehorn them into widescreen monitors. If you spend a lot of your time creating or viewing content, opt for a monitor that can rotate 90 degrees. You'll be blown away by the long, extended view this affords Web pages, Word files, and the like. It's a game-changer. You'll pay a bit extra for a monitor that can pivot, but it's worth it. 2. A USB hub. You can never have too many USB ports, right? More to the point, you can never have too many that are in easy reach. 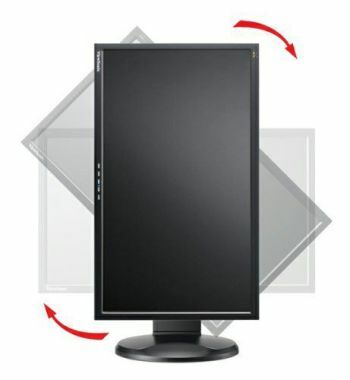 For desktop users in particular, who routinely have to bend down and/or reach around to access their ports, a USB-equipped monitor can be a godsend. So look for a model that advertises a USB hub. Usually this means 2-4 powered ports accessible either on the side of the monitor or in the base. Again, you might pay a slight premium for the feature, but convenience is the return on your investment. 3. A touchscreen. Ever wish your computer worked more like your tablet? If you pair it with a touchscreen-capable monitor, it can. Microsoft baked touch support right into Windows 7, and while it never really caught on, it's actually a pretty nice way to interact with the operating system. You can tap to close a window, launch a program, scroll through a document, and so on. Of course, it'll prove even more valuable once Windows 8 arrives, as the new OS was all but designed with touching in mind. If there's a downside to adding touch capabilities to your shopping list, it's price: the technology adds around $100 to the price of a 22- or 24-inch monitor. On the other hand, once you start tapping, pinching, and dragging, you'll wonder how you ever got along with just a mouse. Okay, those are my picks. What features do you consider essential in a business-class monitor? While you're mulling that over, check out my guide to connecting a second monitor to your PC, and this video on how to set up multiple monitors.